Orthodontics is a unique profession because I have the opportunity to change someone’s life every day. I often think how truly blessed I am to be an orthodontist. Treating so many unique people every day is professionally and personally rewarding. It is an honor for patients to trust me with their smiles. I love to watch patients as they progress through their orthodontic treatment. As their teeth and facial features improve, so do their confidence and self-esteem. Orthodontics has a dramatic effect on the way the world views you and the way you view the world. My goal is much more than straight teeth. I want to give my patients the confidence to face life! 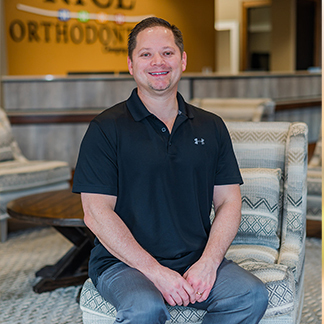 To increase my knowledge and provide cutting-edge care, I attend national, regional, and local orthodontic and dental meetings to keep up with the latest trends in orthodontics as well as general dentistry. I am an active member of the Southern Association of Orthodontists, the Kentucky Association of Orthodontists, and the Purchase Area Dental Society. I received many honors and academic awards in dental school for being at the top of my class, but my greatest honor came when I graduated from my orthodontic training. Two of the longest tenured and highly respected orthodontic faculty told me I was the most particular resident they had every taught in the 25-year history of the orthodontic department at the University of Louisville. My friendly, caring, and fun staff puts each patient at ease and treats every patient like a member of the family. My staff cares about each individual patient’s success and comfort. Most importantly, we all have fun with our patients and each other. Patients love that our office is more than just a place to get a straight smile; it’s a place to have lots of fun, too! Aside from the video games and free snacks, patients can earn tokens for cooperation and win really great prizes! I am a Paducah native and am extremely proud to be a part of this wonderful community. I sponsor our PTSO, the local fall and spring festivals, and numerous youth sports teams. I am also involved with Rebuilding Together, a local organization that refurbishes homes for those in need. My wife Angie and I have been married for 22 years. We have two children, Ansley and Ayden, a fluffy white cat named Coconut, and now a family dog, Oreo! As a family, we feel truly blessed to be back in our hometown close to our family and friends. I’ve always enjoyed playing basketball and graduated from Heath High School in 1989 while my wife graduated from Lone Oak High School. In my free time, I enjoy spending time with my family, my church family, working out, reading, and playing golf. I’m also restoring my very first car: a 1967 Chevelle SS!